Kitzbuehel, Austria – Italy’s Dominik Paris took the victory in the famed Hahnenkamm Audi FIS Ski World Cup downhill in Kitzbuehel on Saturday over two surprise Frenchmen, Valentin Giraud Moine in second and Johan Clarey in third. Bright sunshine allowed the race to be run in front of 50,000 fans from the very top of the course for only the eighth time since Austrian Fritz Strobl set the record time of 1:51:58 in 1997. They witnessed Paris atop the podium where he last stood in 2013. On the world’s toughest downhill course, one small mistake is the difference between finishing on the podium and 10th place. Just ask Utah’s Steve Nyman, who finished 10th in a race where the top 10 were separated by just 0.84 seconds. Nyman, who chose bib 1, soaked in the start festivities and was well on his way to a great run until the Hausberg section on the world’s most famous downhill course. 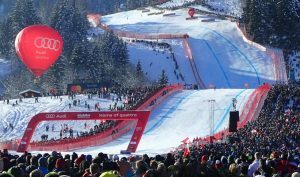 Nyman led four Americans into the top 30 Saturday, including Tommy Biesemeyer of Keene, N.Y., who started bib 50 and posted a career-best 23rd place finish – scoring his first World Cup downhill points – on his first race down the Hahnenkamm. Andrew Weibrecht (Lake Placid, N.Y.) was 19th and Travis Ganong (Squaw Valley, Calif.) was 29th. Jared Goldberg (Holladay, Utah) finished 40th and Bryce Bennett (Squaw Valley, Calif.) finished in a three-way tie for 41st. Austria’s Marcel Hirscher, who did not race Saturday, continues to lead the overall World Cup standings with 980 points. Norway’s Henrik Kristoffersen is second with 692 points and France’s Alexis Pinturault is third with 655 points. 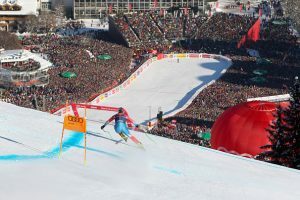 With Saturday’s victory, Paris moved atop the World Cup downhill standings by two points over the injured Aksel Lund Svindal of Norway.